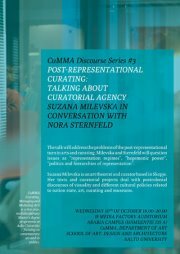 Suzana Milevska and Nora Sternfeld will engage in a conversation that will address the problems of the post-representational turn in arts and curating. They will question issues as “representation regimes”, “hegemonic power”, “politics and hierarchies of representation” that are concepts already challenged in Suzana Milevska’s texts and curatorial projects that deal with postcolonial discourses of visuality and different cultural policies related to nation state, art, curating and museums. Particularly important for the conversation will be the attempt to explore the potentialities of what could come after representation: Can the hegemonial map be challenged by curatorial projects going beyond the “ruins of representation”? The concept of curatorial agency will be proposed as one of the possible answers with putting a particular focus on its linkage to feminism and other art and activist agendas for socio-political change such is the recent calls for solidarity, protests and other community mobilisation through art projects. Additionally the discussion will focus on some methodological questions about curatorial research and new curatorial models stemming out the urgency to accomodate the educational turn in arts that will be expemplified through various Milevska’ curatorial projects.